The European Space Agency (ESA) and Interoute have signed an agreement with the latter to provide a new IP Wide Area Network (WAN) connecting the Earth Observation (EO) Payload Data Systems sites across Europe and Canada. The ESA Earth Observation satellites monitor the natural world gaining valuable insight into the impact of climate change, melting ice, wild fires, and deforestation among other natural phenomena. The advanced Wide Area Network from Interoute will help ESA distribute, store and protect this valuable data. ESA needed to rationalize and enhance its existing connection capabilities, to connect the various EO Data Centres and the main IT platforms for data access and distribution. To meet ESA’s requirements, Interoute has offered a secure private IPVPN connecting the 13 ESA sites to a single performing platform: Interoute MPLS backbone. Interoute’s next generation network will provide ESA with a secure and scalable environment ensuring the consolidation of its disparate data networks, large cost savings and an improved operational efficiency through one central reporting point for all WAN-based issues. 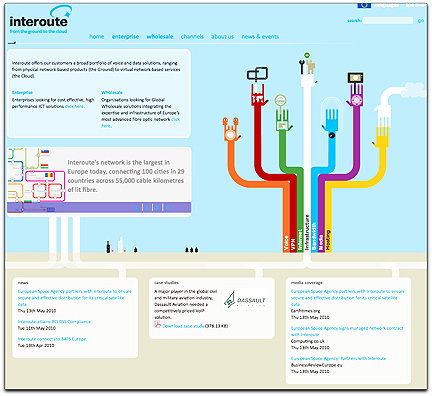 Interoute’s solution includes Internet connectivity (1.2 Gbps access shared by all sites) with a fully redundant design, secured access through firewalls and denial-of-service (DDoS) protection.